On 20 May 2016, cPASS Director Erik Gartzke and cPASS collaborator Jon Lindsay met with Tom Schelling, the Dean of deterrence theory. Professors Gartzke and Lindsay briefed Tom Schelling on their CDDI2 workshop that took place 19-20 May 2016, and outlined their work on the Minerva CDD project. 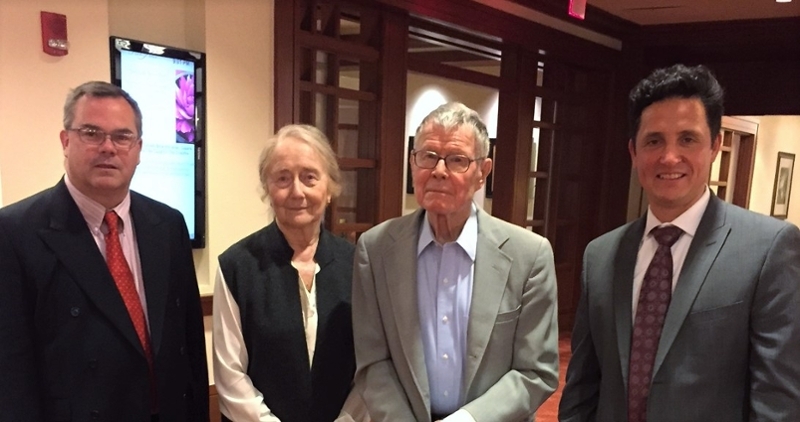 Tom Schelling provided feedback and offered an invitation for future correspondence regarding deterrence theory. Brad Roberts from Lawrence Livermore will be speaking on April 23,2018. Jon Lauder, Nonprofileration Policy Education Center (NPEC) Board Member, will be speaking on May 21, 2018.
cPASS is holding its orientation for potential first year PhD students on Tuesday, March 13, 2018 from 11:00AM to 12:00PM in the San Diego Supercomputer Center (SDSC), Room 145E. According to recently released Nuclear Posture Review, the Trump Administration wants to boost the number of U.S. nuclear weapons, in particular smaller tactical nuclear weapons. To help its audience understand the historical context and possible consequences, KPBS sought the expertise of Erik Gartzke, Director of cPASS. Erik Gartzke and Jon Lindsay's chapter "Coercion through Cyberspace: The Stability-Instability Paradox Revisited" was published in the Greenhill & Krause edited volume. On 18 August 2017, the San Diego Union Tribune profiled the Center for Peace and Security Studies. On 16 April 2017, Erik Gartzke submitted their editorial to Lawfare. Erik Gartzke and Jon Lindsay’s publication received a positive review in the International Security Studies Forum. On 26 March 2017, Jon Lindsay attended The International Security Studies Forum and contributed his essay titled, "The Other Attribution Problem"
On 24 March 2017, Andres Gannon presented his paper and discussed Military Mobilization as a Leading Indicator of Conflict at the Homeland Defense & Security Education Summit. On 12 January 2017, Erik Gartzke gave a talk at the Cybersecurity of Critical Infrastructure Summit at Texas A &M University. On 24 January 2017, Jon Lindsay was a guest on The Agenda, a TV news show in Canada, for an episode on cyber conflict. Why is Iran harassing U.S. warships? Erik Gartzke was interviewed by the San Diego Union Tribune to discuss the recent actions of Iranian patrol boats. Jon Lindsay’s article on Cyberespionage was published in the Asia &The Pacific Policy Society. Jon Lindsay attended a cybersecurity conference in Canberra, Australia and took part in a Cyber-Spying interview with Australia’s The World Today. Jon Lindsay gave a lecture on China and cyber at the Australian National University. Why Isn’t There More Scholarly Evaluation of U.S. Wars? Jon Lindsay was a contributor on the ISSF Forum 13 at the annual meeting of the American Political Science Association (APSA) in San Francisco. Erik Gartzke attended the Kobe Sakura Meeting: The 6th International Conference for Collaborative Research in International Relations & Comparative Politics on 23-25 March 2016. On 10 June 2016, Jon Lindsay presented his work on CDD and cybersecurity for the Defence Engagement Program in Ottawa. Jon R. Lindsay presented the military implications of cyber weapons on 26 October 2016 in the second of three Einaudi Center Distinguished Speaker Series talks on international aspects of the cybersecurity challenge. On 20-23 October 2016, Erik Gartzke cohosted a Peace Science Society International (PSSI) Workshop at University of Notre Dame. On 30 November 2016, Jon Lindsay hosted a round table discussion for the NATO Association of Canada, where he discussed military technology, deterrence, and strategy in the context of international security. On 5 December 2016, Jon Lindsay participated in a Roundtable at the International Security Studies Forum to discuss Cyber War versus Cyber Realities. Erik Gartzke gives a lecture on the roles of Russia and China on international peace, recorded on August 18, 2015.